Once a towering inspirational figure in the musical life of Berlin, later a crucial influence on musicians as diverse as Sibelius, Var�se, Schoenberg and Weill, Ferruccio Busoni is now being rediscovered by a new generation of performers and listeners. Busoni�s sui generis five-movement Piano Concerto is a work that bears comparison to Liszt�s Faust Symphony and Mahler�s Eighth. This revelatory new recording by pianist Kirill Gerstein with the Boston Symphony Orchestra and the Men of the Tanglewood Festival Chorus conducted by Sakari Oramo is a landmark in the wider acclamation of a singular genius who mapped a sublime 20th-century alternative to the modernist revolt of Stravinsky and Schoenberg. The album includes a deluxe 88-page booklet containing rarely published photographs and documents from the Busoni archive at the Staatsbibliothek Berlin. In-depth English and German essays by renowned Busoni scholars Albrecht Riethm�ller and Larry Sitsky discuss Busoni�s creativity and the piano concerto. Given its considerable practical and technical difficulties (some 75 minutes in length, calling for a men�s chorus in the finale, and presenting formidable demands to the soloist), its is remarkable that Ferruccio Busoni�s Piano Concerto Op.XXXIX has fared so well on disc over the years. Pianists from Busoni�s pupil Egon Petri, via Noel Mewton-Wood, Pietro Scarpini and John Ogdon, to Peter Donohoe, Garrick Ohlsson and Marc-Andr� Hamelin have all set down memorable accounts, championing a work and a composer that have had their fair number of detractors over the years. 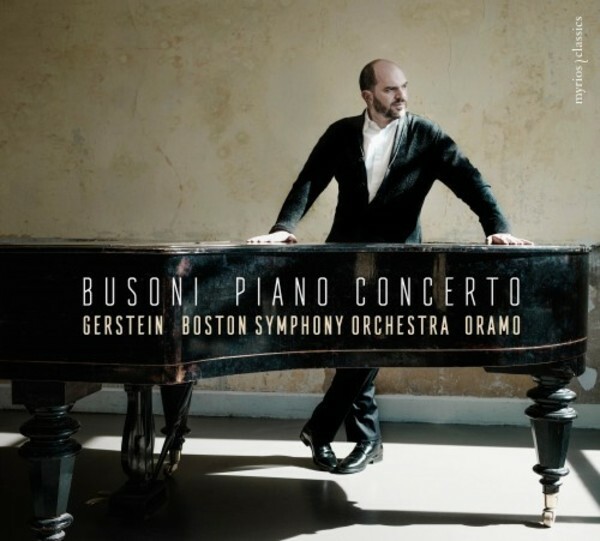 Now comes yet another recording, made live in Boston�s Symphony Hall in March 2017, with star pianist Kirill Gerstein and the Boston Symphony Orchestra, no less, under the baton of Sakari Oramo. And it should be said at once that this is one of the great accounts of this Concerto, immersive in its immediacy, deeply considered and fabulously virtuosic. Busoni�s Piano Concerto (composed 1902-04) is a piece that, by the composer�s own admission, is a summation of his first, late-Romantic period as a composer, a heady mixture of intoxicating (but never showy) virtuosity and turn-of-the-century mysticism. Busoni�s own graphic representation of the work�s five movements has three classical structures - Greco-Roman temple with sun rising behind, Egyptian edifice, and Babylonian tomb (representing the three odd-numbered movements) - separated by scenes from nature: a mythic swan-like bird rising phoenix-like from a huge orchid, and cypress trees with Vesuvius erupting in the background. And an Egyptian-style griffin stands sentinel at the end of the work. All very allusive, but somehow it fits perfectly with this marvellously varied but also monumental music. Fortunately for us, Kirill Gerstein, known for his musical eclecticism, is just the player for this music, as much at home in the dazzling cascades, the filigree passagework or the back-seat observations that are the soloist�s lot in the work�s later stages. The opening movement (the most conventionally concertante of the five) unfolds with a noble inevitability that easily encompasses flashes of soloistic brilliance, the second movement Scherzo has a dance-like swing to it, while the central Pezzo serioso (its three continuous sections presented as a single track) has a majestically solemn, hieratic quality about it, The Tarantella fourth movement is wonderfully animated, the orchestral winds and strings just as virtuosic as the solo piano, with a real sense of italianit� building to a frenzy that makes the crowning Cantico finale seem entirely necessary. And what a finale it is! The Men of the Tanglewood Festival Chorus intone mystical verses of praise from Danish poet Adam Oehlenschl�ger�s Aladdin (not to be confused with the popular pantomime of the same name!) with a youthful but restrained vigour, lifting the work�s closing pages to a higher spiritual plane. This is music that takes leave of, and at the same time celebrates, a whole era of music as well as Busoni�s first compositional phase: there are references to Beethoven, Berlioz, Liszt and many others, but the overarching spirit, as Larry Sitsky points out in his excellent notes on the Concerto itself, is that of Mahler. If Brahms�s First Symphony can affectionately be described as �Beethoven�s Tenth�, then Busoni�s �Opus XXXIX� could likewise be thought of as the piano concerto that Mahler never wrote, its five-movement layout, two scherzos, and closing chorus mysticus all referencing a composer whom Busoni so admired. And with Genstein, Oramo and the Boston forces, the listener really gets a sense of that ambitious, all-encompassing scale, in a performance where detail and overall design are entirely in harmony. Audience noise is minimal and unobtrusive, but there�s a palpable sense of occasion, and the recording has a �live� feel to it in the best sense, relatively close-miked but also tonally rich and warm. Anyone who already knows and loves this music will certainly want to add this performance to their collection, as it�s one of the most assured performances of the Concerto there has been in many years. And, thanks to Myrios�s lavish presentation, which also includes a substantial essay on Busoni�s wider output and philosophy, as well as abundant illustrations, this is also the perfect introduction to the work for newcomers. All in all, this is a fantastic achievement, and another considerable addition to Gerstein�s impressive discography, outstanding in every respect.